The Voice premiered on NBC this week with the first round of Blind Auditions. This is the first year I’ve watched the voice from the beginning (last season, I only watched the final few episodes), and after Monday’s and Tuesday’s episodes, the only thing I regret is waiting until the 5th season to start watching. I've got to say, The Voice is NOT like the ‘other’ singing competition shows out there. I stopped watching those a couple years ago. They became too commercialized and focused more on profit and ratings rather than on the contestants and the talent. But, fortunately, I stumbled on The Voice by accident last season and saw something very different—the focus was on the artists AND the talent. I saw genuine care and concern from the ‘coaches’ toward the artists. The coaches truly want them to be the best they can be. For those of you who have been watching The Voice, you know what I mean... For those of you who haven't been watching, you really should give it a go. It’s not like the ‘others.’ This one is very enjoyable and entertaining, all while showcasing some amazing talent, both raw and experienced. It's that mix of experience level that really makes the show what it is. The Voice doesn’t hide if a contestant has had a recording deal in the past, or is in a band that performs regularly. They don’t care... a stage singer or a bedroom singer... it makes no difference. Talent is talent. The coaches see through the nerves of performing for the first time to see the talent underneath. All you’ve got to do is look at Season Four winner Danielle Bradbery—a sixteen year old who only sang in her bedroom. I don’t know what she sounded like in the beginning (because I wasn’t watching), but I heard how she sounded in the end. She is amazing. If the coach (in this case Blake Shelton) can take someone who has never performed before and produce a powerhouse like Danielle—that says so much about what the show is about. The concept of Blind Auditions is much better than the ways other singing shows conduct auditions. The coaches don’t see the contestant performing; therefore, the evaluation (and choice of advancing a performer) is based solely on the voice... looks play no factor so cause no judgements. Season Five of The Voice brings back the original four coaches to the panel. I have no previous experience to compare what the show was like with the original four or without, but I have to say, the chemistry between all the coaches seems fun and real. 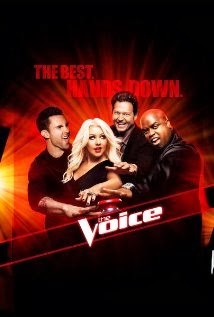 Adam Levine, Blake Shelton, Christina Aguilera, and CeeLo Green make the show even better. The ‘back-and-forth’ between them is fun to watch. The ‘fighting’ for a contestant to pick one of them is entertaining. Even the ‘threats’ and ‘teasing’ is in good nature. They don’t take away from the contestants, but rather add another level of entertainment that is not over-the-top. Week one’s Blind Auditions has advanced seventeen people so far to the next round. From what I’ve learned (as I am new to the show), is that each judge gets twelve people, for a total of forty-eight talented artists who will advance to the next round. TEAM ADAM has five artists already, but none of them makes my top four after Week One. It is worthy to mention, though, Donna Allen’s soulful performance of “You Are So Beautiful” was very powerful, to the point that she had Adam bouncing in his chair. She may go far in the competition, but so far, Team Adam... not my favorite. TEAM CEELO has coveted four highly talented singers but also does not have one in my top four. He did get Kat Robichaud—a rock and roll powerhouse with a strong and raspy vocal element. Her performance of “I’ve Got the Music in Me” shows that she will probably go a long way in the competition. CeeLo also won over Caroline Pennell (after she won over CeeLo). With her rendition of “Anything Can Happen,” we heard a very soft but captivating vocal range. Adam likened her to the spinning girl in a music box. Caroline showed a hint of Sinead O'Connor, which I think can grow and take her into the top ten. TEAM XTINA landed four talents—two of which are in my top four. Matthew Schuler took the stage and had every one of the coaches spin their chairs within the first ten seconds of the song. His performance of “Cough Syrup” was solid, but it was the charismatic and solid vocals that easily won over the coaches and put him on my list. Destinee Quinn also takes a spot in my top four with her performance of “Cowboy Take Me Away.” She is an experienced club singer, and it shows. Her controlled vocals have a definitive country sound, and I can’t wait for Christina to help her bring the power I know is there. TEAM BLAKE also has four amazing singers on his team, with two of them in my top four, including my top pick of Week One. First off, Blake managed to obtain Austin Jenckes after his performance of “Simple Man.” Austin has very natural and calm vocals. Nothing was forced, and all was just flawless. It is, however, 19-year-old Holly Henry who takes my top pick of Week One. Holly has never performed in public before but has this unique quality to her vocals. She sang “The Scientist” by Coldplay, and every nerve in my body suddenly came to life. I can’t explain it—chills ran through me, emotions began rising from nowhere, and the rest of the world became a distant and faded place. It's as though her voice transcends time and space. She seems to possess this amazingly unique ability to take her emotions and put them into the song, but not like other artists who use their emotions to make the song more real—Holly seems able to take her pure and raw emotions, put them right into the song and actually transfer every one of her feelings directly into you with her voice. It’s truly an amazing experience to hear her sing. With guidance and coaching from Blake, you’ll see her in the top ten... then the top five... top two... and maybe... The Voice. Come back next week for my review and opinions about Week Two’s Blind Auditions as the coaches try to fill their teams with whom they want. Can Blake Shelton take it all for a fourth season? See you next week Voice fans! "The 47th Annual CMA Awards"
Airing on Wednesday, November 6, 2013 (on ABC), the CMA will hand out its iconic trophy to the best in country music across twelve categories, and the CMA takes as much pride in the actual trophy as it does in the award it represents. The trophy each winner will receive is a hand-blown fine Italian Crystal obelisk with a beveled base. It is hand-made in Florence, Italy, but the final assembly is done in Nashville by Francis & Lusky. 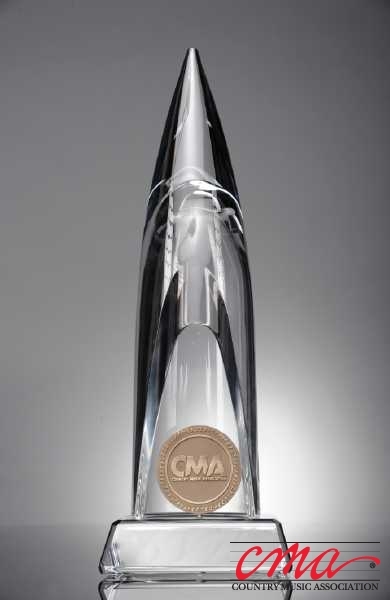 The 15” trophy weighs 7.5 pounds, contains the CMA logo die-struck in polished bronze, and has the winner’s name and CMA award engraved into it. Of all the awards shows, the CMA trophy is the most aesthetic. Unlike some awards shows, where the fans cast the votes to determine the winners, the CMA Awards are determined by ballots cast by the more than 11000 industry professional members of the CMA. So, instead of a popularity contest based on an artist’s fan base, the CMA Award winners are chosen and honored by their peers in the music industry. This year’s show will be co-hosted (for the 6th consecutive year) by Carrie Underwood and Brad Paisley. The past five years have been a pleasure to watch with both of them as hosts (with the exception of Carrie and Brad poking fun (in bad taste) at Taylor Swift’s latest break-up during the 2012 show). Brad Paisley and Carrie Underwood have a chemistry together that works very well for the show. Where almost all other awards shows change the host or hosts every year, the CMA has chosen to stick with the same ones. 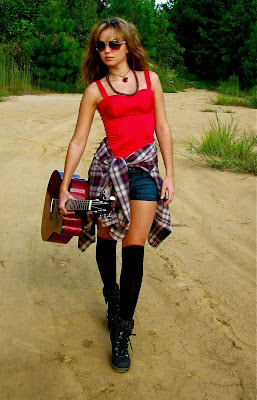 The people in country music are smart that way—if it ain’t broke... don’t fix it! This past Tuesday, the CMA announced the nominations for 2013. There were some surprise names that showed up and some names that were surprisingly absent from the list. The two leaders in number of nominations are both female and a little surprising. Kacey Musgraves and Taylor Swift both landed six nominations each—followed closely by Blake Shelton with five nominations. Kacey Musgraves is a relative new comer to the country music scene and is nominated for “New Artist of the year.” That nomination is no surprise—her powerful vocals basically scream country music. Even her nominations for “Single of the year” and “Song of the year” (as a songwriter) are not that surprising. What I find surprising (not in a bad way) is that very rarely will you see a “New Artist of the year” nominee also nominated for “Female Vocalist of the year,” a category usually reserved for those who have been in the industry for many years. Also surprising to me, is the six nominations for Taylor Swift. It’s not that she isn’t talented and popular (I do like her music), but the pop/country crossover artist has crossed so far over into pop music that Nashville is nothing more than a distant and dim shimmer of lights in her musical rear-view mirror. How she can still be nominated for country music awards baffles me and upsets me. She is no more a country music artist than Carley Rae Jepsen or Katy Perry, and by pretending to still be country when it suits her, she is basically stealing nomination spots from others that are more deserving and much more country. It really came as no surprise when the 2012 CMA Awards garnered Taylor Swift zero wins from her three nominations. Kelly Clarkson is again nominated for “Best Female Vocalist,” which is odd, as she really doesn't have that solid of a foothold in the country music industry, yet. Talented? Absolutely. Strong enough presence? Not really. Hunter Hayes, who was the 2012 winner of the “Best New Artist” received no nominations this year. The multiple Grammy nominated singer has had three consecutive Number 1 hits off his debut album, “I want Crazy,” but still got snubbed in all categories. Finally, Carrie Underwood received three nominations, but has once again been denied a nomination for “Entertainer of the year.” Carrie Underwood has amassed six Grammys, and her latest album, Blown Away, has sold well over 1.5 million copies, which made it the second best selling country album of 2012. She just finished up her 114 date “Blown Away Tour," and has been described by Billboard as being “Country Music’s reigning Queen.” Does it make sense to anyone that her name is still missing from the “Entertainer of the year” nominations? Nonetheless, the CMA Awards will be an amazing show as always—Showcasing the best in country music and giving the fans a show to remember. The CMA Awards broadcast is one of the best and should not be missed—Wednesday, November 6, 2013... don’t be late! Get the official app for "The 47th Annual CMA Awards"
My predictions on who will walk away with a trophy will be posted closer to the broadcast. (Update: November 5, 2013 - Read my predictions here. Follow me on Twitter or Facebook, so you don't miss out. Are you surprised by some of the nominations? Are you upset by those passed over this year? Leave your thoughts in the comment section below. You can read the complete list of all the nominations and check out the latest news on the CMA Awards official website.